USA Imaging Supplies Blue line and Engineering Rolls and Sheets go through a rigorous inspection and approval process which meets or exceeds OEM specifications for optimum moisture content. Sheets are lint free and protectively sealed in a moisture protective wrap for long term storage. Available in case or bulk-bin quantities. All rolls are produced on a 3” recycled, industrial strength core. The use of high quality paper produces crisp, vivid images that are easily readable and longer lasting. 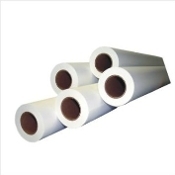 Our top quality engineering rolls and sheets are straight and even for a quality print the first time. If you need additional assistance please call us at 619-684-5241 We work for you!